All Posts Tagged With: "Celebrity Hairstyles"
Marcus Francis worked with Mia Wasikowska at this year’s Cannes International Film Festival. Marta Walsh has the scoop on how to her Mia’s red carpet look..
Mia Wasikowska at the Tree of Life Premiere, May 16, 2011. Hollywood was buzzing last night at the “Source Code” premiere! Movie-star Vera Farmiga turned to Suave Professionals Celebrity Stylist, Jenny Cho, to create a “windswept updo” for the big event. 1. Spray Suave Professionals Volumizing Root Boost Spray to damp hair, to support volume on the roots, and blow dry with a medium size round brush. Kristen Stewart’s hairdo on the cover of Vogue February 2011. 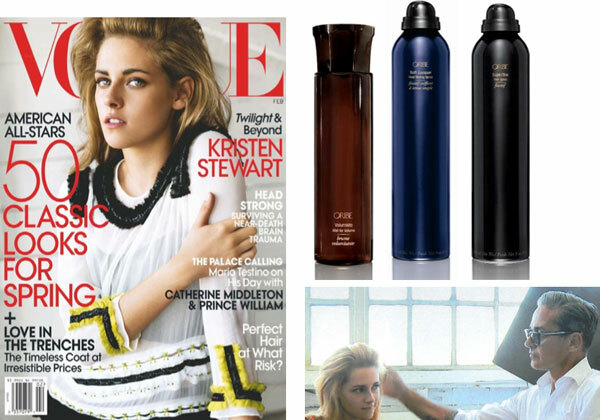 Iconic hairstylist Oribe created a textured, natural look for Kristen Stewart’s February Vogue cover shoot. “Kristen is a beautiful young girl, and this was all about softening her hair to go with the clothes she wore on the cover,” Oribe noted of his inspiration. Now Oribe reveals how to add volume, body and movement for this relaxed yet chic style. 1. Spray the hair, section by section, with Oribe Volumista Mist for Volume. This plumping mist swells the hair shaft and leaves it feeling thicker with great texture and hold. Blow‐dry with a round brush for added body and movement. Anna Paquin’s Hairdo at the 2010 Emmy Awards. Frederic Fekkai Celebrity Stylist, Renato Campora, created a soft yet glamorous style for Anna Paquin. The Hairstyle & Inspiration: A soft yet glamorous look to compliment her dress by Alexander McQueen. On wet hair, Renato Campora applied the Fekkai Full Blown Volume™ Styling Whip to the roots and the Fekkai Coiff™ Perfecteur Anti-Frizz Silkening Crème. Once dried, he used a ½ inch curling iron and set the hair in pin curls. After 15 minutes, Campora removed the curls and ran his fingers through the hair to loosen and create shape. Spotted: The Hills star Kristin Cavallari with a new Farrah Fawcett hairstyle! Is this the making of Kristin Cavallari? Maybe! Do you love? The Bang. Winner: Nicole Richie. It’s no surprise that the prize for best fringe goes to Richie. “The full bang is very late ’60s, early ’70s, so it’s the perfect vintage accessory,” says Richie’s stylist, Andy Lecompte. Spotted: Marta’s favorite girl Hayden Panettiere sporting a new red hair color! I need few seconds to get used to it, it’s not too bad actually. What about you guys: Do you love Hayden has a redhead? Rachel Bilson leaves the Andy LeCompte Salon in West Hollywood, CA, January 18th, 2010, where she got new highlights by colorist Denis De Souza. Do you love? GET THE LOOK: January Jones’ dramatic hair look at the 67th Annual Golden Globes Awards, created by top celebrity stylist Mark Townsend, introduced a new, modern take on red carpet style. I started by applying a small amount of Moroccanoil Treatment to January’s damp hair and blow-dried it with a round brush. This unique argan oil-infused formula gives the hair amazing shine and silky finish, an essential to the look I had in mind. When the hair was dry, I took a dollop of Moroccanoil Hydrating Styling Cream into my hands and then finger combed the hair to give a soft hold and add even more shine and leave the hair extremely smooth. GET THE LOOK: Love Avatar star Zoe Saldana’s hairdo at the 2010 Golden Globes? Talking Makeup got the scoop and the hair tutorial on how to recreated it at home! 1. Starting with damp hair, apply TRESemme 24 Hour Body Foaming Mousse, and part hair to one side (slightly off center). Blow dry with a small round brush. 2. Spray a soft hold hairspray all over head, like TRESemme 24 Hour Body Finishing Spray, and curl 1″ sections using a 1″ barrel curling iron. Let hair twist as your wrap, and pin to scalp. 3. Let the hair sit in pin curls for at least 10 min. Take out pins, and brush delicately, without a lot of tension to keep the shape.